Fitbit is a small electronic activity monitor that you clip to your belt, bra, or some other article of clothing. It tracks steps taken, distance traveled, stairs climbed, and hours of sleep. Through your home computer and network, it transmits that information to a website where you can track your progress over time, or if you have an iPhone or iPad, it can synchronize this data to an iPhone app. It is an ingenious, inexpensive, and possibly life-saving piece of wearable technology. The Fitbit Ultra is still available from some retailers, but the company has discontinued it. The square object is a stand for the recharger and sync cradle, which attaches to your Mac (or some lesser computer) via USB. The Fitbit Ultra itself is quite small, as you can see from the quarter. Not shown is the cloth Sleep Band for holding the Fitbit on your wrist as you sleep. Click on image for larger version. 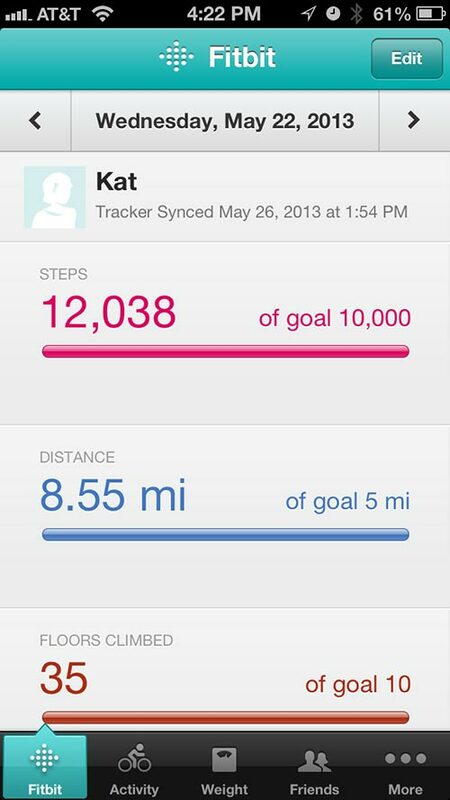 The Fitbit can’t make you more active, but it certainly can document with great precision your level of activity. As a general rule, adults should walk roughly 10,000 steps every day to keep all the various body parts happy, and get eight hours of sleep. In the U.S., only a fraction of adults reach the step goal, and sleep deprivation is increasingly seen as serious problem rivaling excess weight. Fitbit One is the replacement for the Fitbit Ultra. A very short USB cable has replaced the recharging cradle, with a custom clip at one to hold the electrical connections. 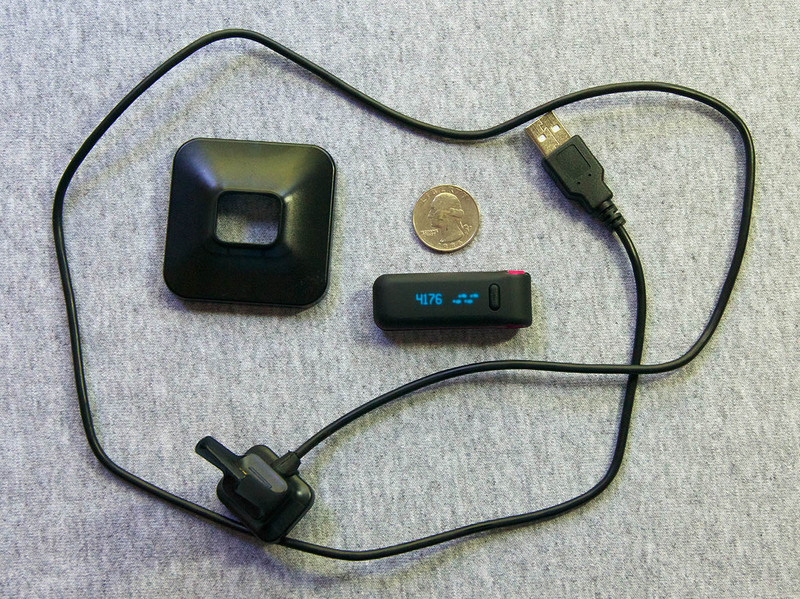 Below the quarter you can see the USB Bluetooth dongle that allows the Fitbit One to talk wirelessly to your Mac. (It can also use Bluetooth to talk wirelessly to an iPhone 4S or later, or an iPad 2 or later). The object in the bottom right corner is a flexible holster for the Ultra, with a strong metal clip, for clipping to belts, pockets, pants, bras and other items of clothing. Not shown is the cloth Sleep Band for holding the Fitbit on your wrist as you sleep. Click on image for larger version. Monitoring steps can be done with a mechanical pedometer, but pedometers are generally not that reliable, and keep no records. The Fitbit not only reliably tracks your steps, but also the number of floors you’ve climbed in a day. It uses multiple electronic accelerometers to also track the intensity of your activity, and keep track of your activity for as long as a week between recharges. Periodic syncing to your iPhone, iPad or computer allows you to gather extensive evidence regarding your level of activity, and the Fitbit website awards badges as you reach certain milestones, such meeting your step quota, or quota for floors climbed, or distance. You can receive a weekly summary of your activity and badges earned by e-mail. Sleep tracking is where the Fitbit really shines, as conventional sleep logs are difficult to accurately maintain. You wear the Fitbit attached to a wristband, and it tracks your body motion during sleep. Most people will probably be shocked at how poorly they sleep, and having a running record provides a powerful incentive to work on getting a proper night’s rest. 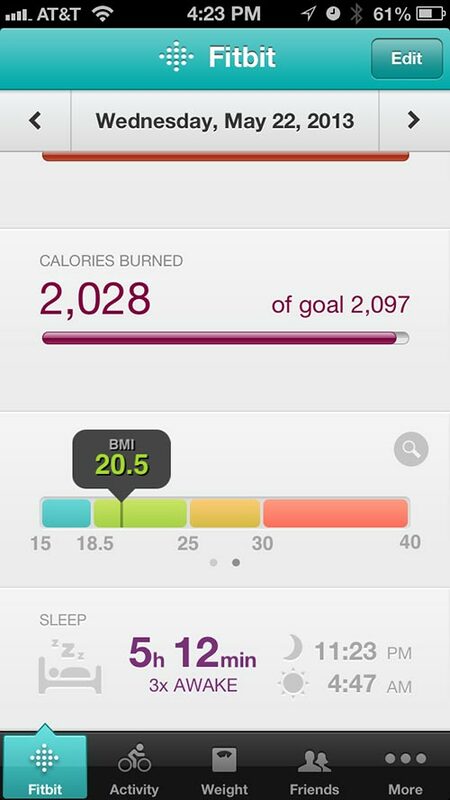 This screen shot from the Fitbit iPhone app shows a summary of activity so far that day. The same app is used on the iPad, but unfortunately is not designed for the iPad; it looks exactly the same, just larger. Click on image for slightly larger version. The Fitbit website also allows you to track your food intake, but as this is a manual process, it isn’t as easy as activity tracking. You enter items in the food log via a computer, or an iPhone app, and while it is well designed, it is by no means automatic. The web site also allows you to log heart rate, blood pressure, and glucose readings, but like the food log, these must be entered manually. 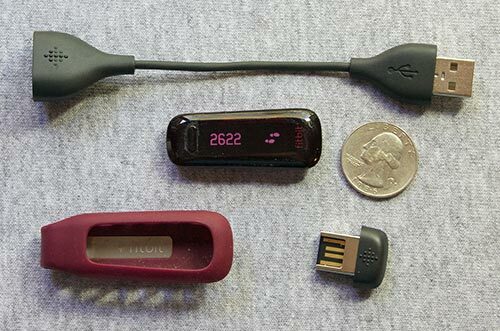 Both of us tested the Fitbit Ultra tracker, and quickly found the ease of use to be addicting. We both wore it everywhere except the shower and swimming, tracking our steps, floors, and sleep. Both of us soon found ourselves going out of our way to meet the daily step and floor quota, and slowly but surely carving out time for good, quality sleep. We like the way the Fitbit provides feedback on activity and sleep with minimal effort. We found another app that requires less effort to record what we eat. Living healthy requires a balance between level of activity, good nutrition, and adequate sleep. Scrolling the summary screen on the Fitbit iPhone app brings up more information, including weight (measured by a different device, the Fitbit Aria wireless bathroom scale) and the sleep summary. The Fitbit recorded that the wearer went to bed late, got up early, and woke up three times during the night, for a pathetic five hours and twelve minutes of sleep, well under the recommended eight hours. Click on image for slightly larger version. An accident severely damaged one of the Fitbit Ultras, and we replaced it with the new Fitbit One. The design and peripherals differ, but it has the same basic functions. For reasons not entirely clear, it isn’t as good at detecting climbing floors; after a day that involved climbing 12 to 18 floors, it often credits you with only four or five. The Fitbit One (unlike the older Ultra) is also supposed to sync with an iPhone or iPad over Bluetooth, and it does -- maybe. The iPhone needs to be an iPhone 4S or newer, and the iPad must be an iPad 2 or newer; older iPhones and iPads don’t support Bluetooth syncing. We are great fans of the Fitbit, going so far as to encourage friends, relatives, and coworkers and sometimes complete strangers to get one. It is a tiny piece of technology with the potential to extend your life. $99.95. The Fitbit One, and its less expensive (and less capable) sister, the Fitbit Zip, are also sold by Apple’s on-line store, and at larger Apple brick-and-mortar stores.